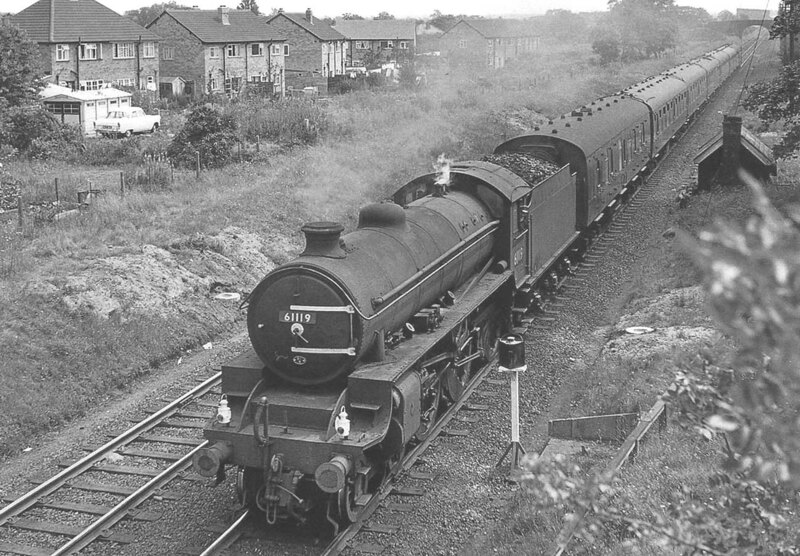 Ex-LNER 4-6-0 B1 class No 61119 is seen at the head of the 7 am Norwich Thorpe to Birmingham New Street service on 31st July 1963. Built as LNER No 1119 by the North British Locomotive Company in January 1947 it remained in service until November 1963 when it was withdrawn from March shed to be scrapped at Doncaster Plant in January 1964. With Sir Nigel Gresley's death in 1941, Thompson became the LNER's Chief Mechanical Engineer (CME), and quickly initiated a plan of locomotive standardisation and modernisation. This was in stark contrast to Gresley's policy of creating new locomotive types only when required. This suited the LNER's economic restraints, but did lead to many different types of locomotive with few common parts. High on Thompson's standardisation plan, was a mixed traffic 4-6-0 type. Initially designated 'Class B', they had been reclassified to Class B1 by the time the first locomotive No. 8301 Springbok had been completed in 1942. The pre-existing Class B1 were reclassified as Class B18. The Thompson B1 would quickly become the most successful of Thompson's locomotive designs and a total of 410 were built by the LNER and British Railways. The standard 4-6-0 design was intended to replace all of the 4-6-0s (excluding those replaced by the Pacifics), all of the heavy 4-4-0s, the D11 4-4-0s, the D49 4-4-0s, the passenger Atlantics, the K2 2-6-0s, the K3 2-6-0s, the J6 0-6-0s, the J39 0-6-0s, and other high speed 0-6-0s. Most of these replacements were achieved in practice - a compliment to the standardisation process. For more information see the LNER website.